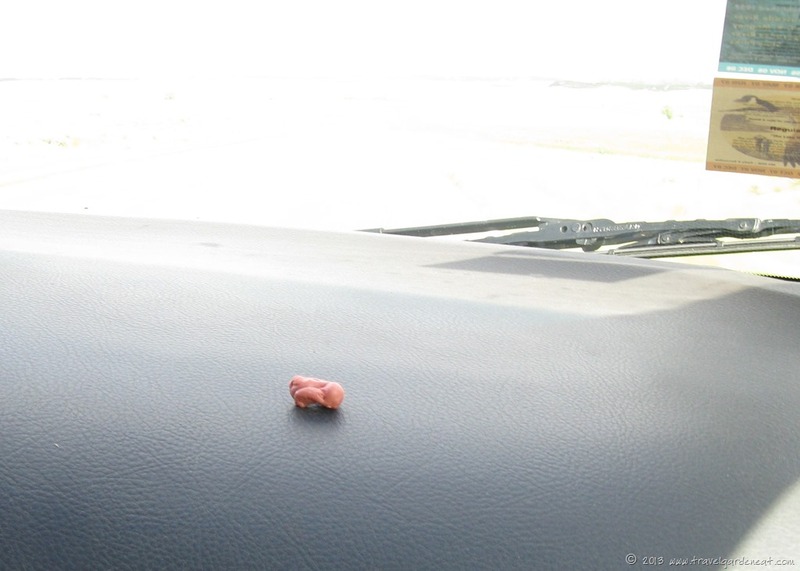 road trip – Travel. Garden. Eat. 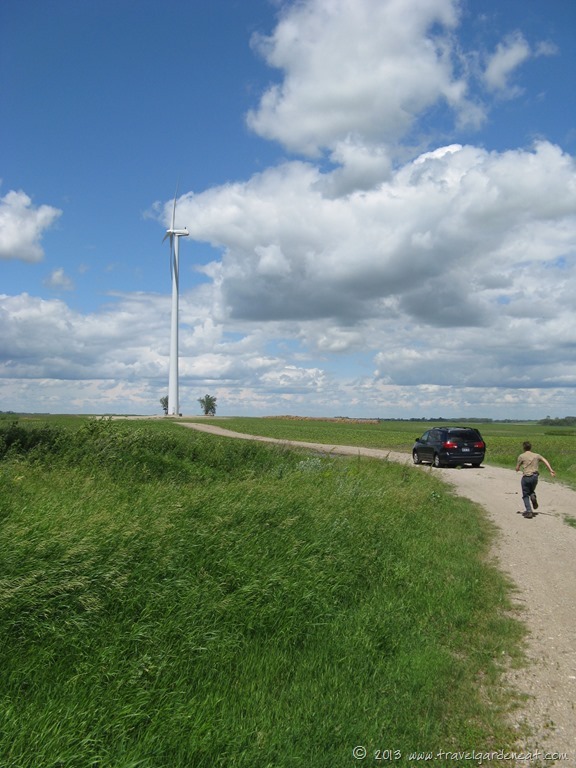 A creative response to this week’s Photo Challenge? Perhaps not. 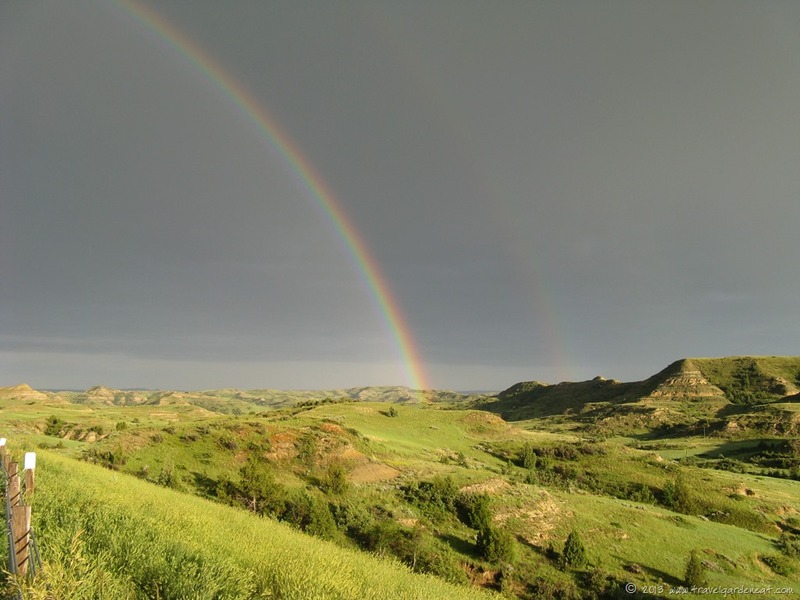 But, this rainbow so vividly displayed the full spectrum of colors, as we drove through Theodore Roosevelt National Park in western North Dakota a few years back, it immediately came to mind when I reviewed our photo charge for the week! 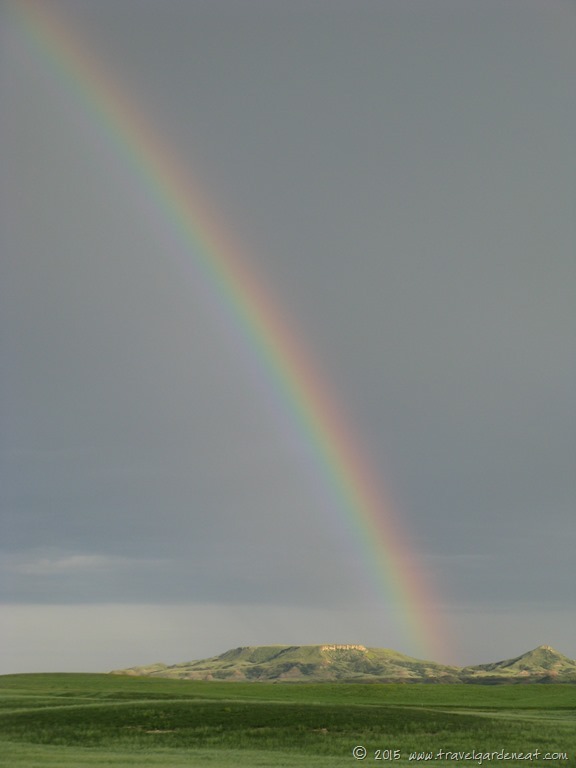 If only we had more time, perhaps we could have discovered that pot of gold lurking behind the butte at the end of the rainbow …. This post was in response to the Daily Post’s Weekly Photo Challenge. ”ROY G. BIV” is this week’s theme. Everyone is welcome to join in the Challenge; further details on how to participate and links to others’ responses are found here. 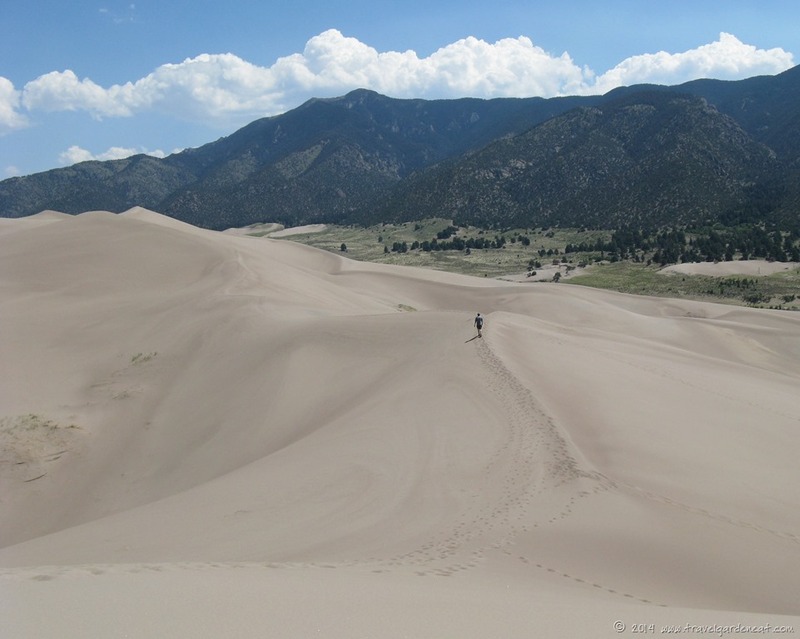 I gave you a glimpse of the Great Sand Dunes National Park in the post for this week’s photo challenge. 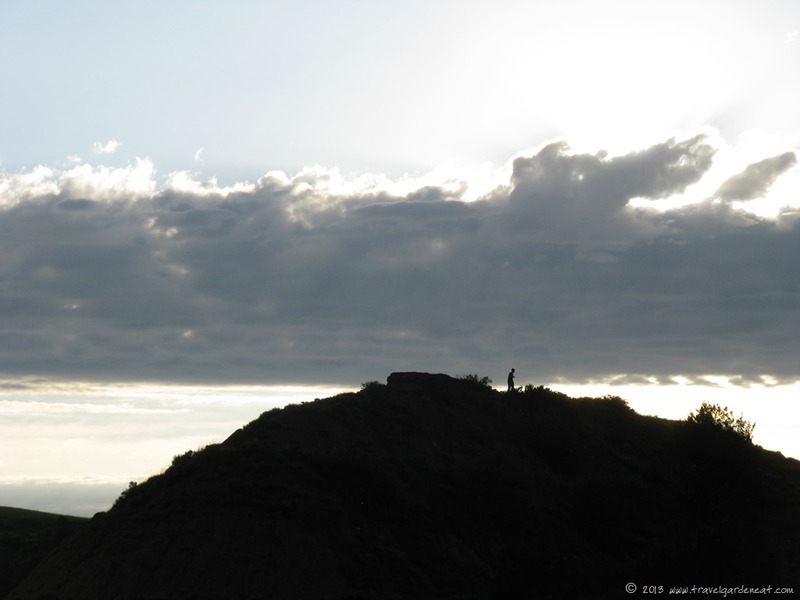 It is worth revisiting in more detail, starting with the sunrise at San Luis State Park, just outside the dunes. 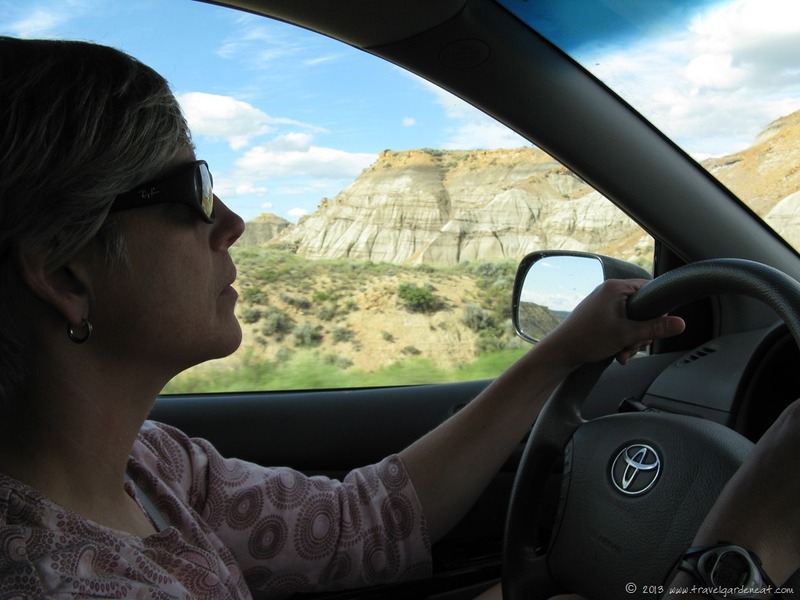 The San Luis campground was the ideal launching pad for a day trip to the Dunes as we continued our road trip through Colorado. 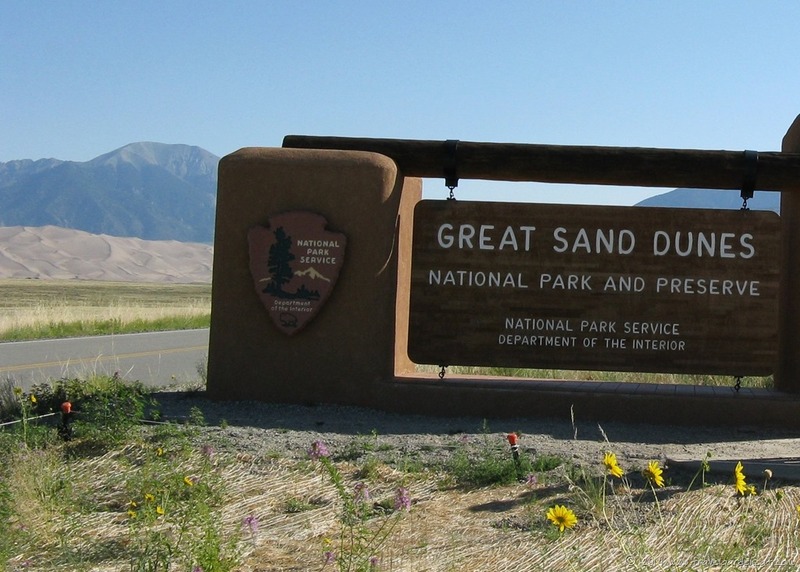 As you approach the park entrance sign, the dunes are like a mirage at the base of the Sangre de Cristo Mountains. 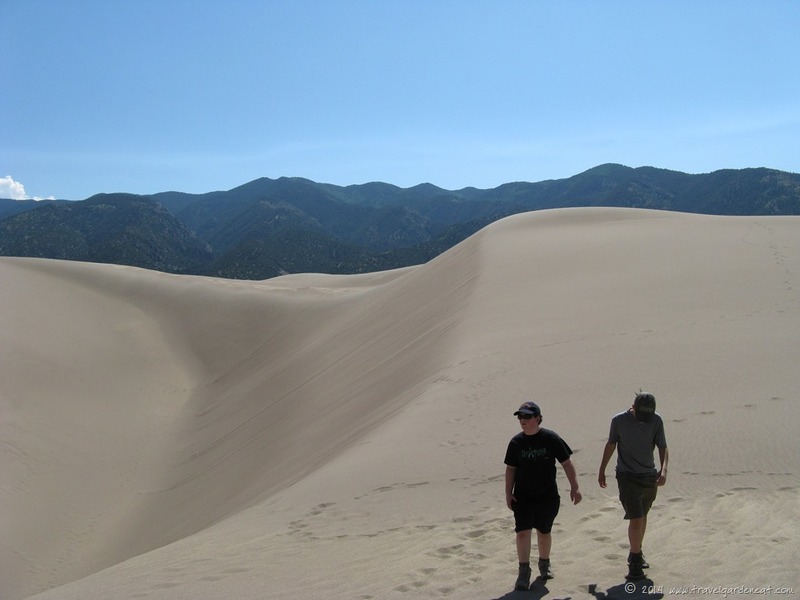 Hiking the dunes on a summer day requires a morning start — that sand bakes in a hurry under a hot sun. 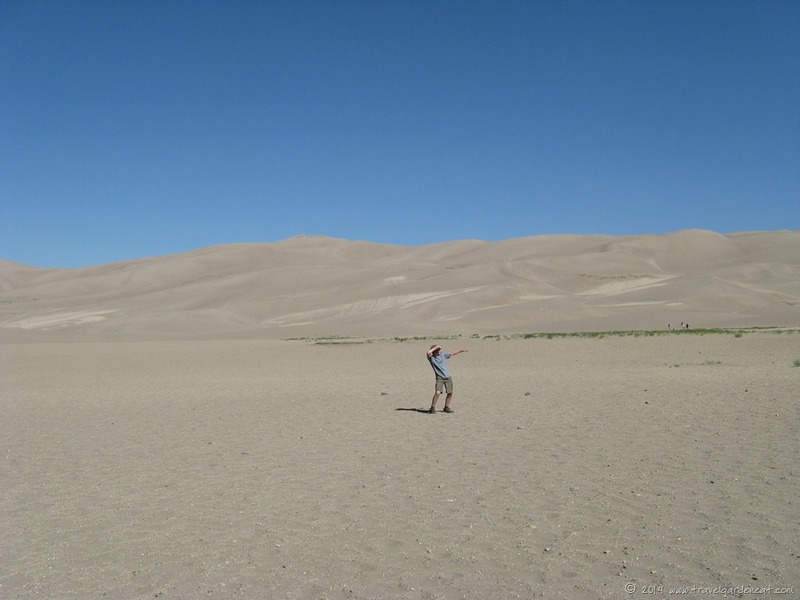 With no trees or other objects to provide cover or shade, one quickly gets a desert hiking experience. 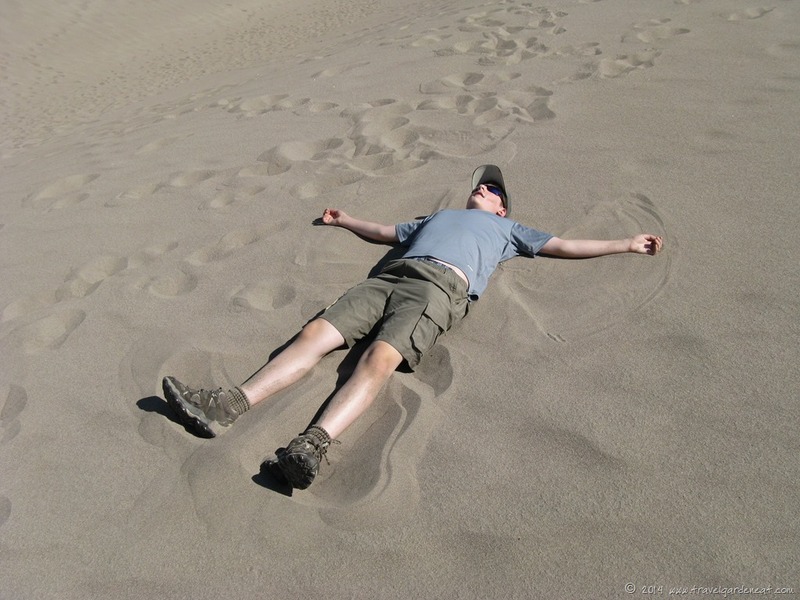 Sand angels are not a wise idea when you have your camera in your pocket. Photos are great tools for capturing memories; this photo will always capture the memory of my son’s camera literally biting the dust. 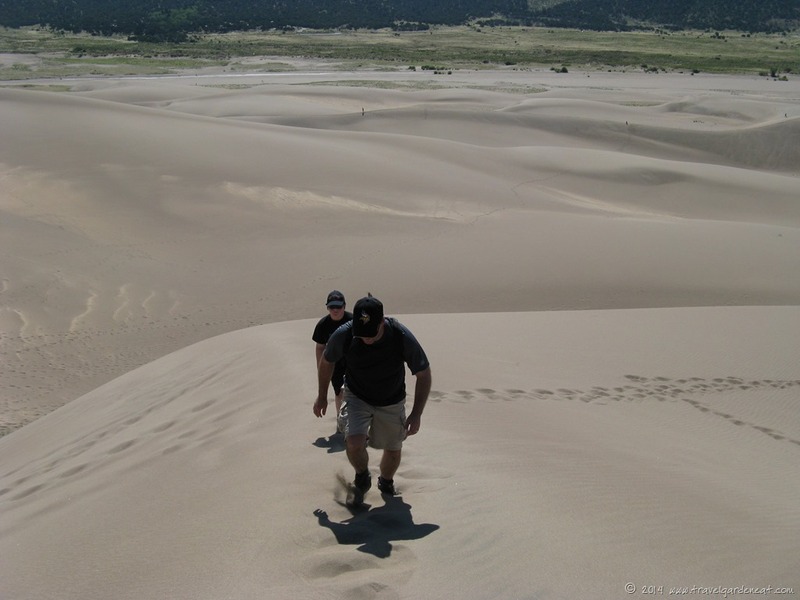 It took awhile to get the hang of climbing the dunes — there is a strategy to minimize the feeling of walking on a treadmill. Not all came to hike. We saw visitors with makeshift sleds, and others on skis, treating the sand like a warm weather ski hill. No problem with congestion at this vast venue! 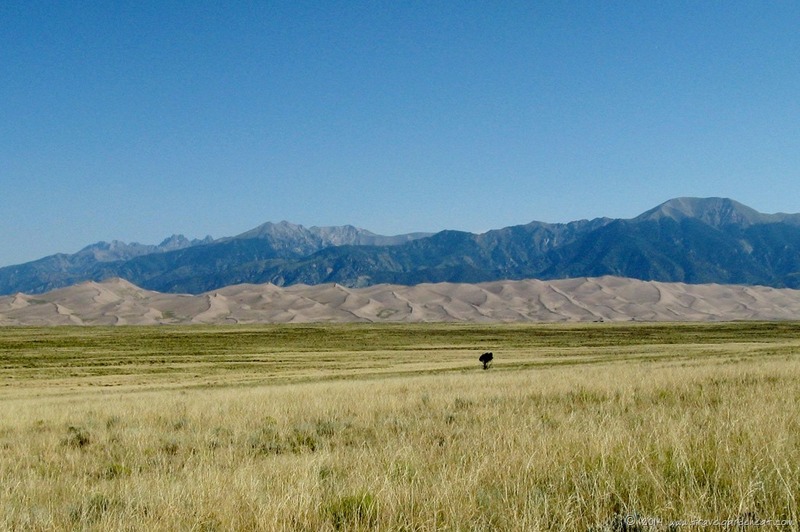 Great Sand Dunes National Park has such a unique setting — neverending desert-like dunes butted up against the extensive Sangre de Cristo mountain range. Sunrise and sunset would provide for some phenomenal photo opportunities! 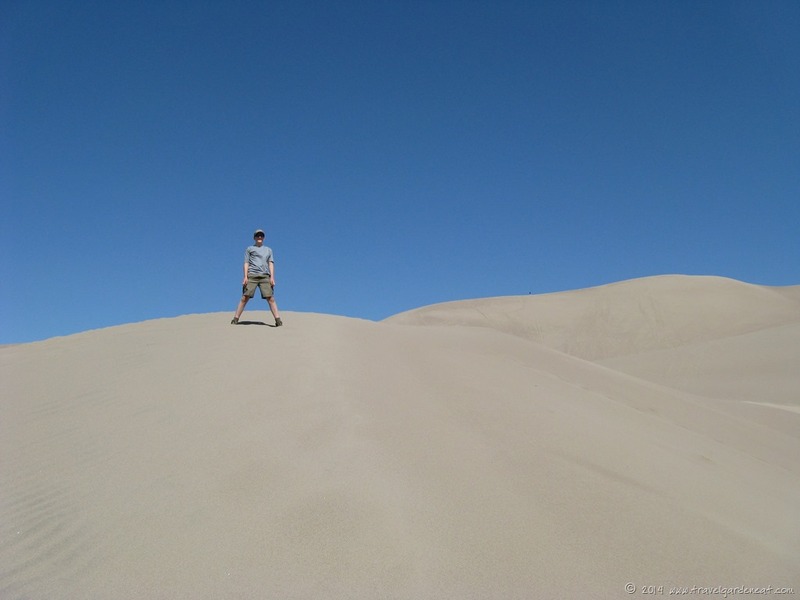 We had a goal of hiking to the top of the tallest dune, but settled for the second tallest, by our estimation. We sat and rested for a water break before the return hike to the car. Water bottles were quickly depleted, and sunglasses essential, as the sun climbed to its midday spot. If you are pressed for time, even a half-day stop to wander through the Visitor Center and take a short walk onto the dunes is worthwhile. 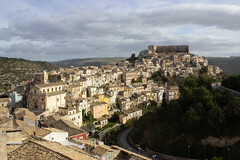 However, spending a day or two exploring the nearby mountain trails and activities would make for a fun weekend trip. We barely scratched the surface of this fascinating site. 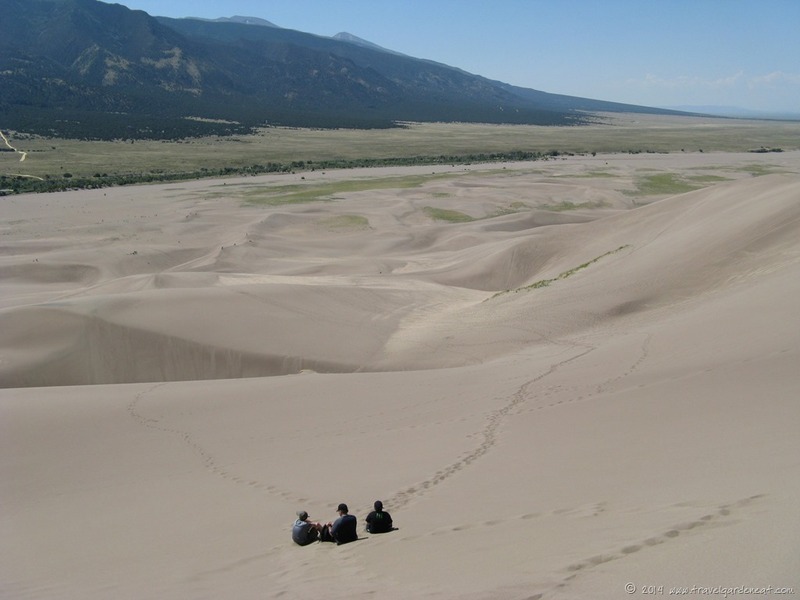 The National Park website for the Great Sand Dunes National Park has all the information you need to start planning a visit to this unique Colorado destination. 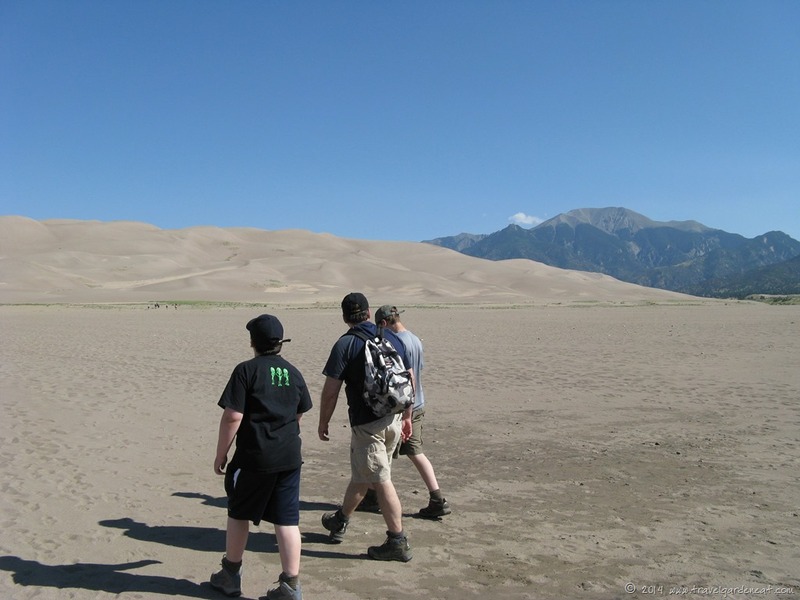 Returning to another great road trip memory for this week’s challenge: my son standing on top of a sand dune at Great Sand Dunes National Park and Preserve in Colorado. Check back tomorrow for more photos from this interesting National Park, and the greater perspective and context of these dunes. This post was in response to the Daily Post’s Weekly Photo Challenge. ”On Top” was this week’s theme. Everyone is welcome to join in the Challenge; further details on how to participate and links to others’ responses are found here. 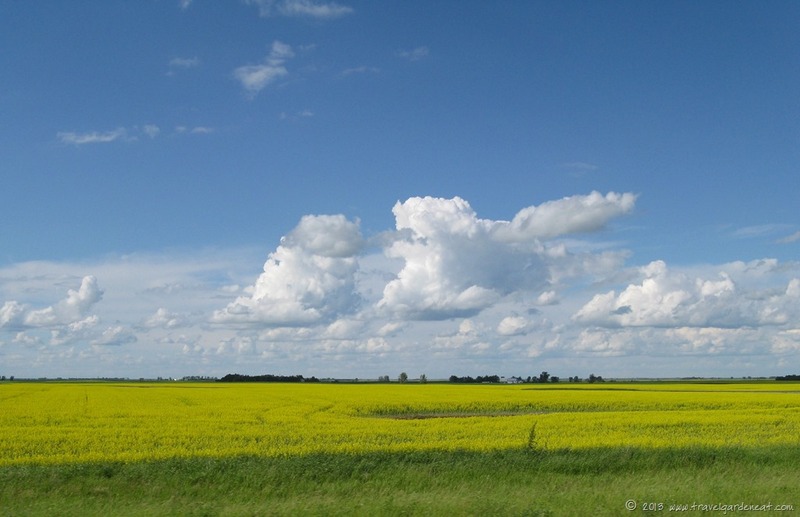 I am saddened that our days of the classic summer road trip are over. We had a good run of them. Then our boys became involved in summer activities or jobs that made it increasingly difficult to schedule around, and they went on to create their own special memories with friends old and new, as it should be when your children grow up. 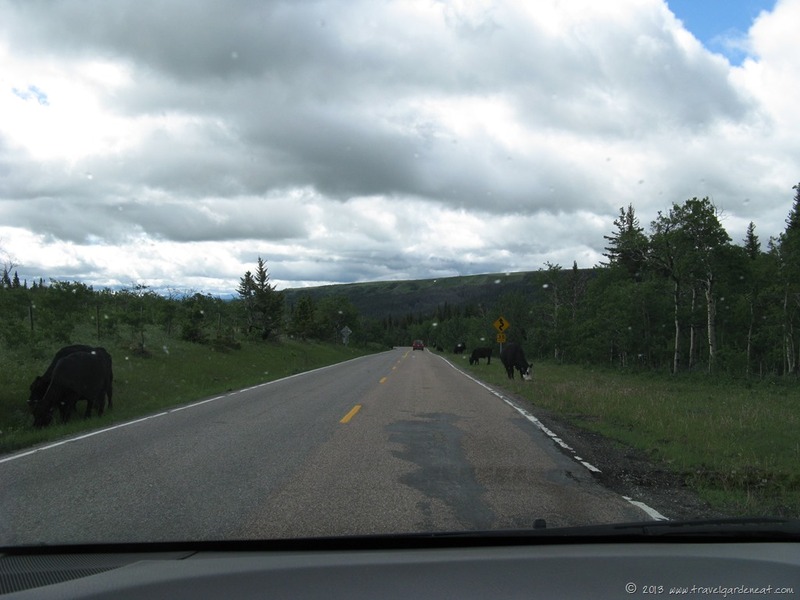 Since summer road trip season is not too far off (or so I like to believe as I watch the snow get blown about outside my window …. 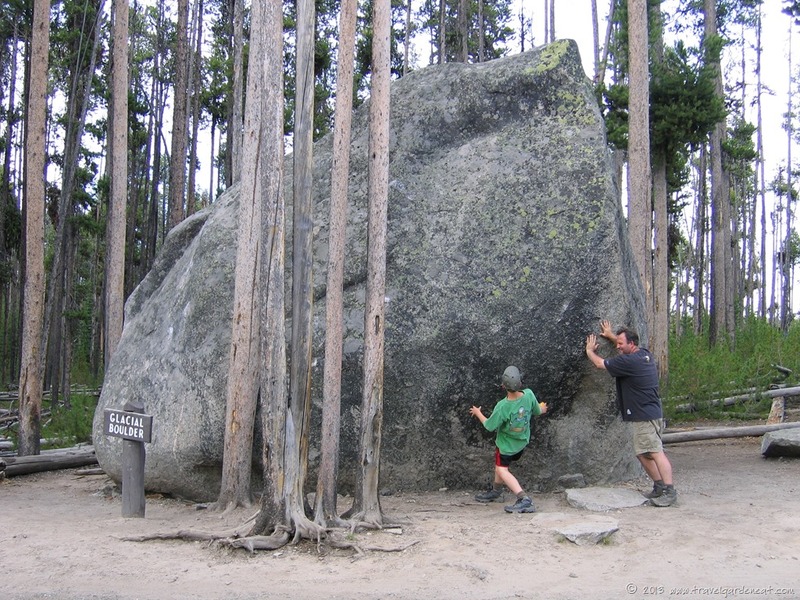 ), what better time to dig into the photo archives and share some of my family’s favorite travel memories from over the years. 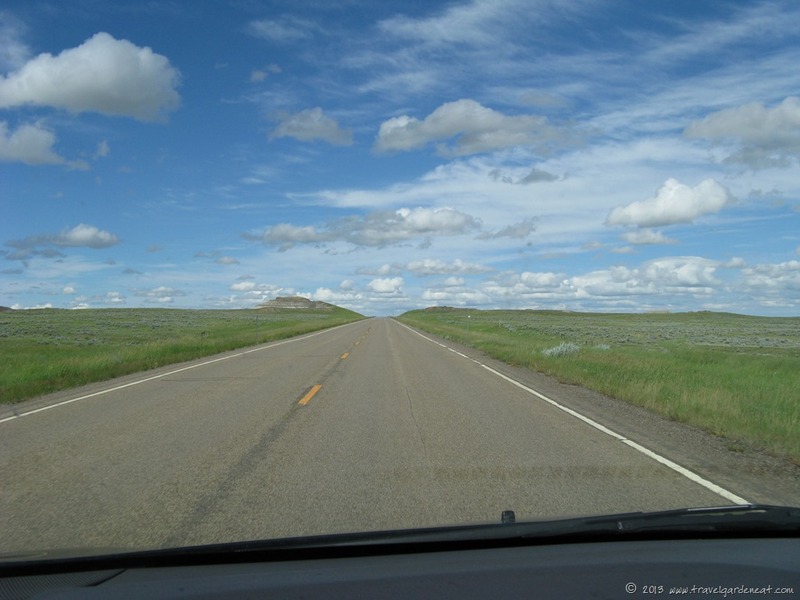 Our summer road trips usually involved a National Park destination or similar natural setting. 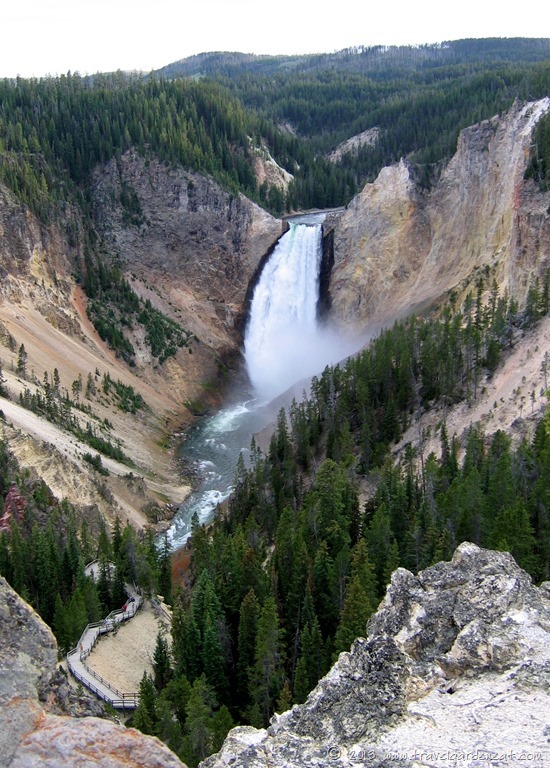 If you had to select just one classic U.S. National Park to visit for that summer adventure, you could not go wrong with Yellowstone National Park. 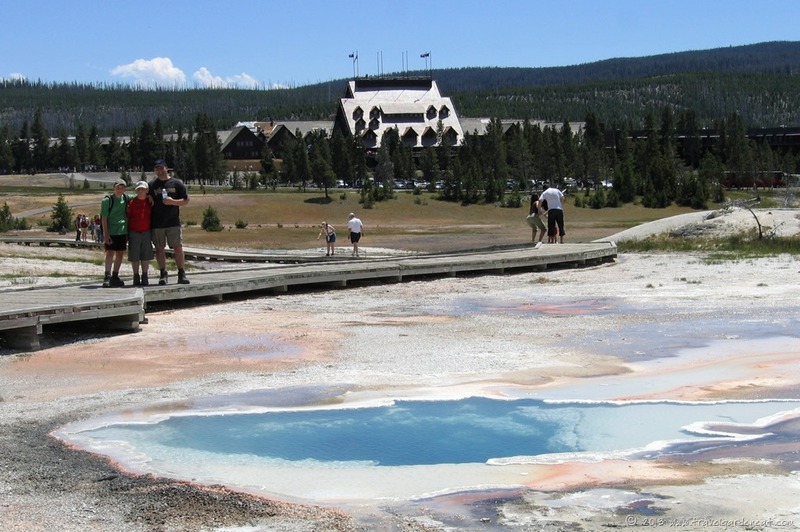 Yellowstone has an amazingly diverse landscape, from the colorful steaming pools and murky paint pots, to the geysers and rivers and lakes. 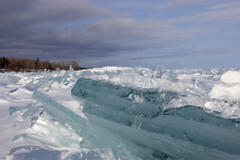 The glacial landscape results in some amazing scenery. 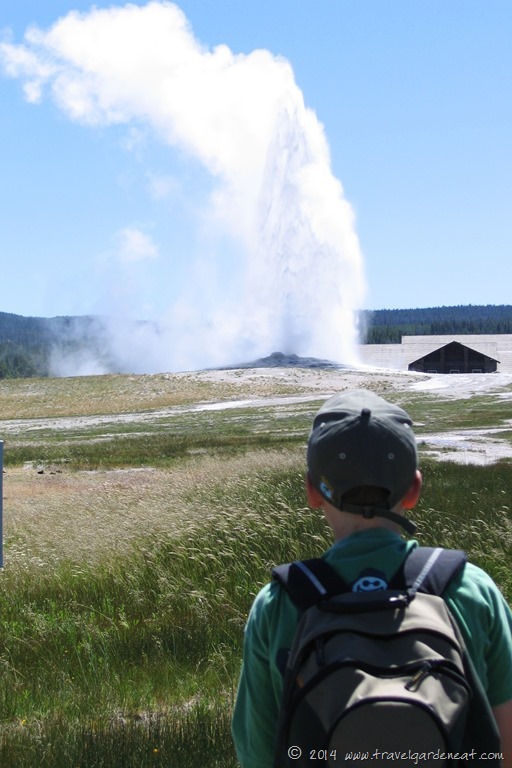 While Old Faithful is a classic sight, it is in the center of the Upper Geyser Basin activity. 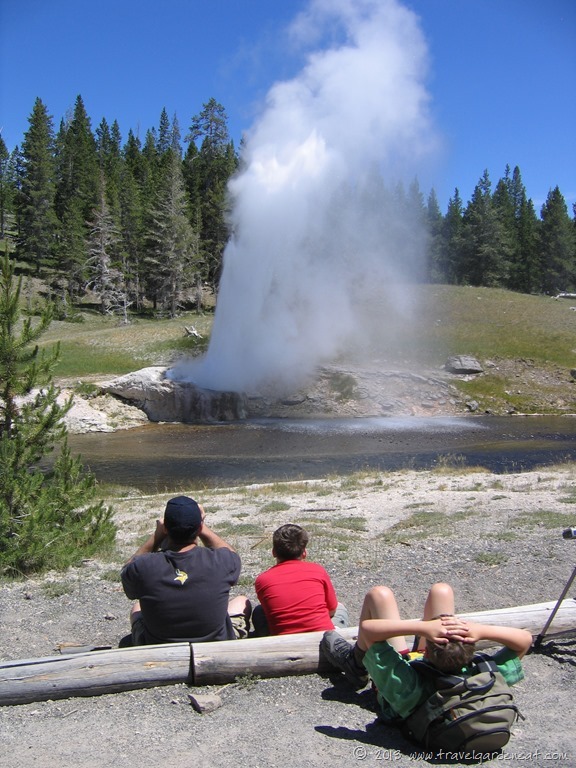 We found that sitting along the banks of the river on a hot day, watching the River Geyser go on for ages, provided a peaceful respite. 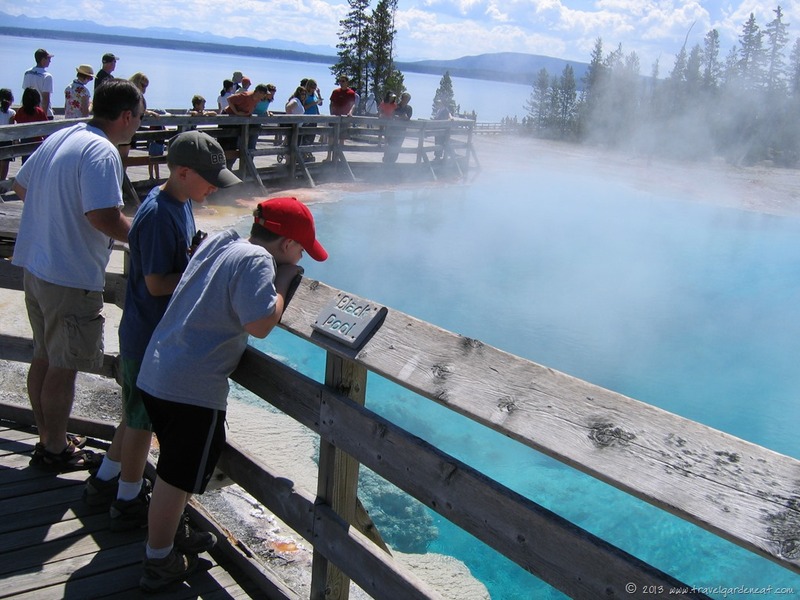 A person also could spend much of the day pondering the midnight blue depths of the Black Pool, alongside Lake Yellowstone. Some water features of the park are hidden far below the surface, showing themselves only through the steam escaping from vents scattered about the Park. Then there are the incredible moving bodies of water — both the Upper and Lower Falls are scenes straight out of a postcard, captured through the ages in paintings and photography. 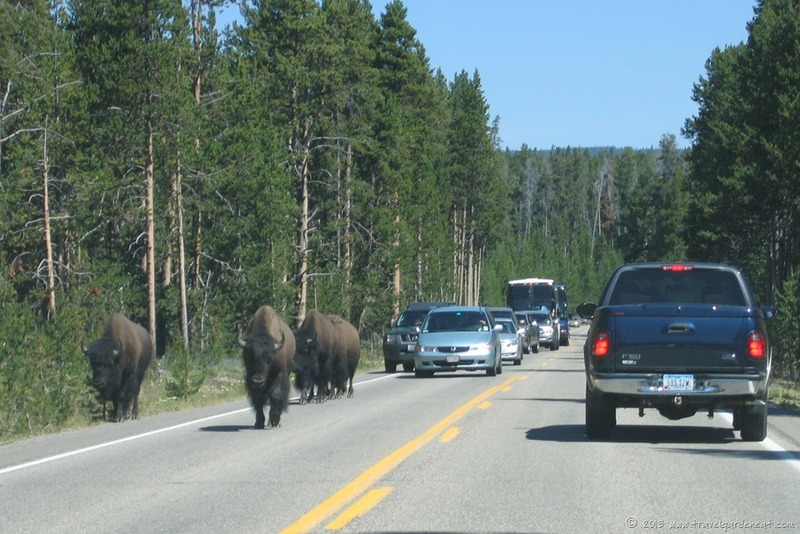 Yellowstone presents the classic sight of buffalo letting drivers know who rules the road. 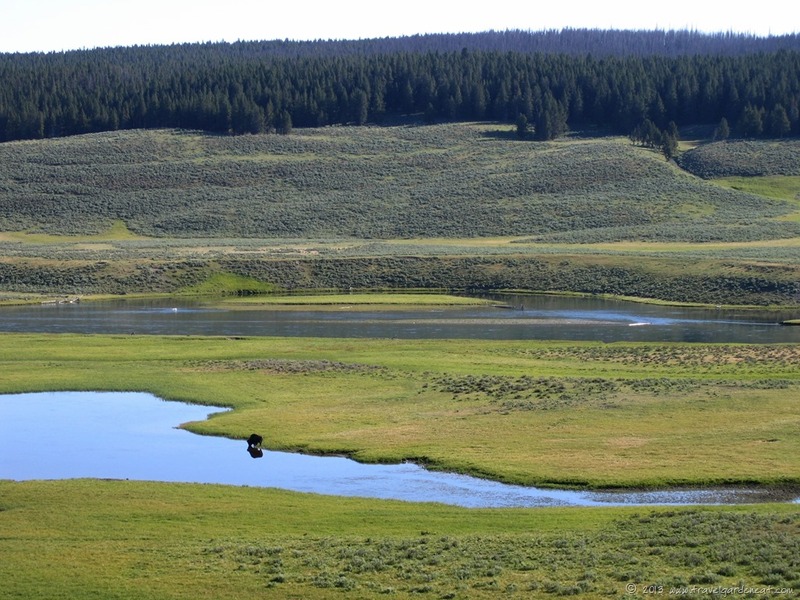 Congestion is quickly escaped, though, by enjoying the vast rolling greens of Hayden Valley. 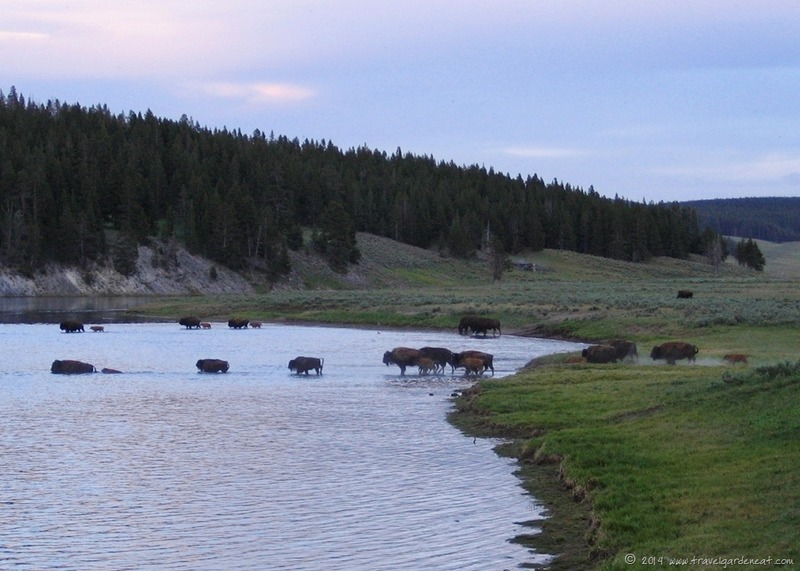 Even Hayden Valley meets with a traffic jam on occasion, as the herd moves to its evening grounds with the sunset. 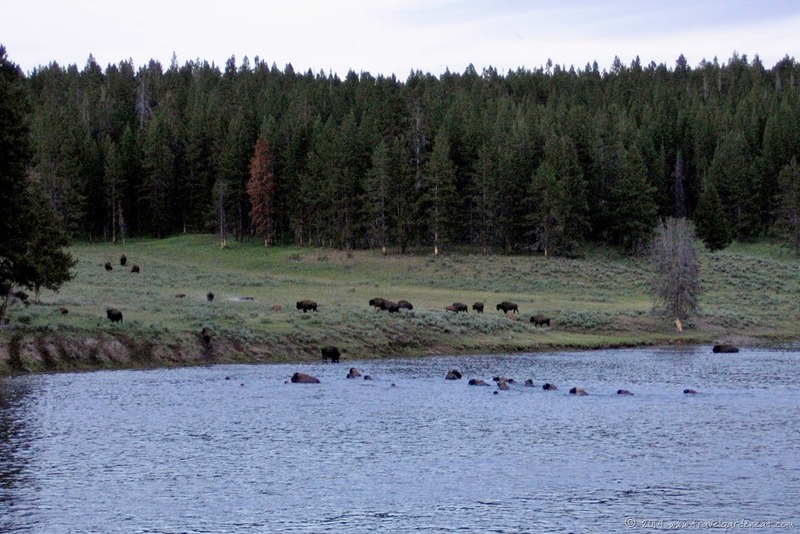 What an awe-inspiring sight it was to watch buffalo after buffalo, mother encouraging their young, large bulls kicking up the dust, as the line of buffalo snorted and grumbled its way across the highway, down the bank of the river, across the river, and then off into the valley beyond. 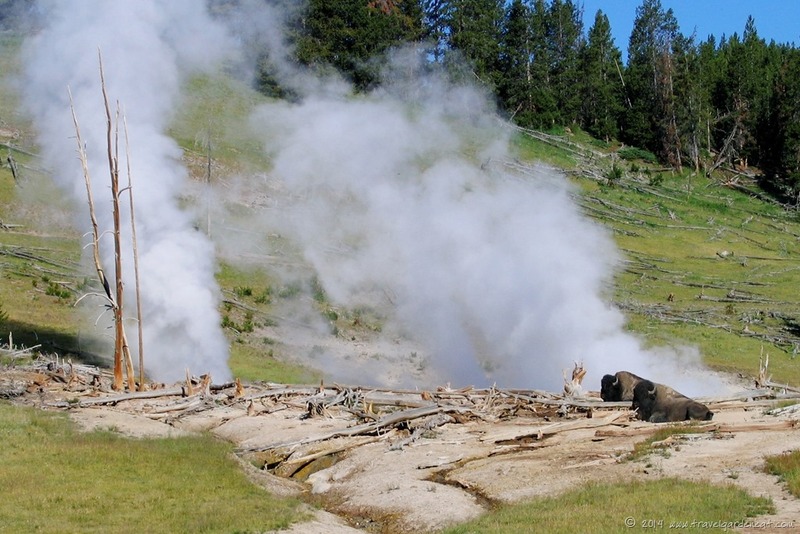 The National Park Service’s website is your best starting point for planning a visit to Yellowstone National Park. 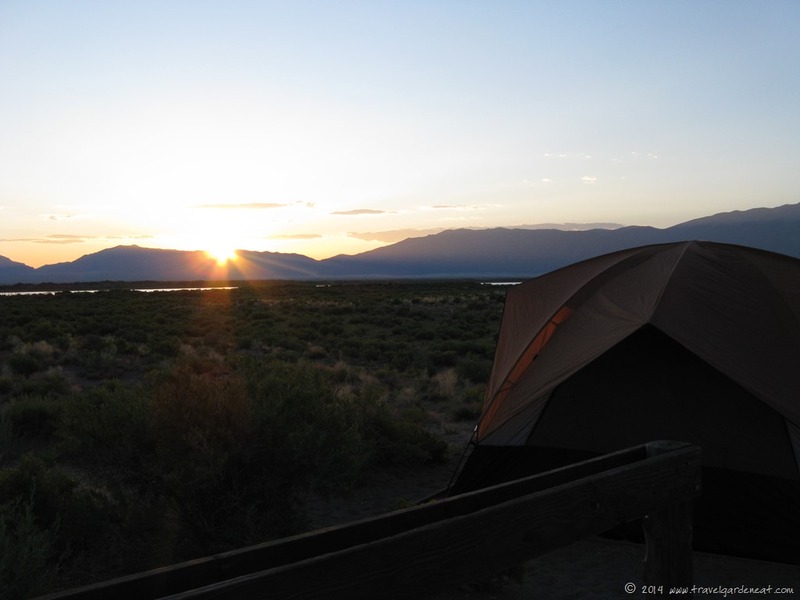 If you intend to stay inside the Park, plan your reservations far in advance, because lodging fills early during popular summer vacation dates.